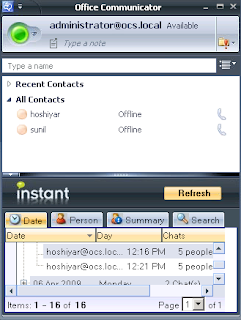 Intstant developed the internal Sametime IM disclaimer application in response to several IMtegrity customers and their need to notify Lotus Sametime users that their conversations may be recorded and monitored. Since we are involved in Sametime Gateway deployments, we have also been receiving requests to create an external IM disclaimer application to notify external users (i.e. Yahoo, AOL users) that their conversations may be monitored and recorded. This week, we are announcing the first in a series of applications for the Sametime Gateway. 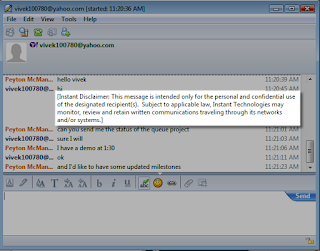 Our Sametime Gateway IM disclaimer application is a server based gateway extension that monitors all external IM conversations and provides an IM disclaimer notification to external users (typically running Yahoo, AOL, or Google). 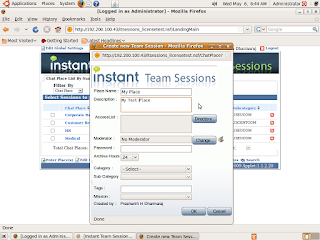 The Instant IM disclaimer application for Lotus Sametime may also be configured to notify internal users that their Sametime IM conversations may be monitored. We have had requests to included regular expression filtering (in order to prevent certain combinations of phrases from passing through the Lotus Sametime IM gateway) so that will be the next application to be included in this grouping. We are seeing a bunch of cases where the Notes 8.02 client is hanging on start up. Usually, immediately after the authentication dialog, the Notes client will just 'hang' with an hourglass. Of course, on a customer site, or even internally, this is a problem. nlnotes.exe instead of notes.exe. Ah....problem solved. Many of our customers deploy our Instant Archive Viewer for Microsoft OCS using 'in place' tabs within the OCS client. Here is a nice picture of a few of the Instant folks (Peyton McManus and Todd Fuder) accepting the best in show award. Lotusphere is always the best place to meet our customers, hear new ideas, and have 4 days of fun with our customers. Recently, a large customer requested that we support Linux (well, Ubuntu) with our browser based client for Instant Team Sessions. With Team Sesssions 3.1, we have added supported for Linux to our browser based client. In version 3.1, we have also updated the Sametime plugins to work well within the Notes 8.5 client - another customer request.